Mitch McConnell promotes industrial hemp: Senate Majority Leader is fighting to remove hemp from Controlled Substances Act. Republican Sen. Mitch McConnell, majority leader and industrial hemp advocate. Sen. Mitch McConnell is a friend of the farmer. The six-term Kentucky Republican proudly touts his agricultural achievements, including his two Golden Plow Awards from the American Farm Bureau. Now the newly minted majority leader is set to take on a new battle for farmers that pits him against some strongly held views among his fellow conservatives: legalizing large-scale production of industrial hemp. [A] shipment of 250 pounds of hemp seeds left Italy destined for Kentucky as part of a pilot project made legal by the 2014 federal farm bill. … The hemp seeds cleared customs in Chicago, but when the cargo landed at the UPS wing of Louisville International Airport, the Drug Enforcement Administration seized it, arguing that importing hemp seeds required an import permit, which could take six months to process. If farmers couldn’t get those seeds into the ground by June 1, the entire first year of the hemp pilot program would be dashed. 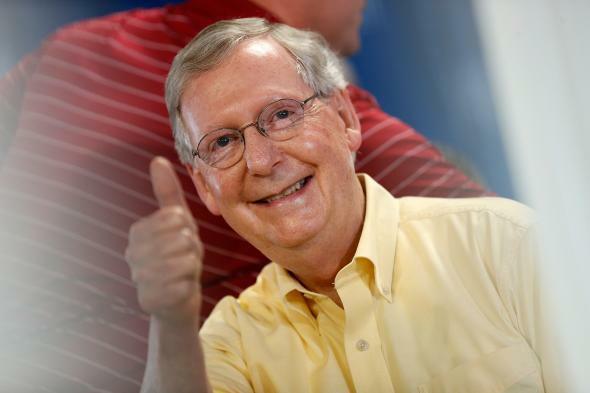 McConnell—then the Senate’s minority leader—worked furiously to free the seeds from the DEA’s clutches and continued the pro-hemp drumbeat throughout 2014, as he campaigned for reelection. McConnell’s vocal support for legalized hemp isn’t just a talking point for the farmers back home—it’s helping to construct a rare bridge between the increasingly polarized parties in Washington. The Senate’s Industrial Hemp Farming Act of 2015 is co-sponsored by McConnell, likely presidential candidate Rand Paul, and both of Oregon’s Democratic senators. Pro-hemp crusader Rep. Thomas Massie has pulled together more than 50 bipartisan co-sponsors for his House version.